blade spine: 3/16" tapering to 1/16"
This is a copy of a basket hilted backsword which is in the Victoria and Albert Museum in London. The original is an English basket hilt dating from 1620 with a blade inscribed "Andrea Ferrarra" but which is actually German as were many Scottish and English Basket Hilted sword blades and rapier blades; there was great trade with Germany in the 1600s for sword blades as they took over from Spain and Italy who had dominated the 1500s market. The English made many of the actual basket hilts which were used in Scotland at this time and the style is now thought to have originated in England in the late 1500s. The English abandoned the style later because the hilt restricts fencing movements; but the Scots, who were basically civilian militia, kept the style because it suited their hack and thrust style when used with a shield and thus came to be associated with them as a uniquely Scottish weapon. 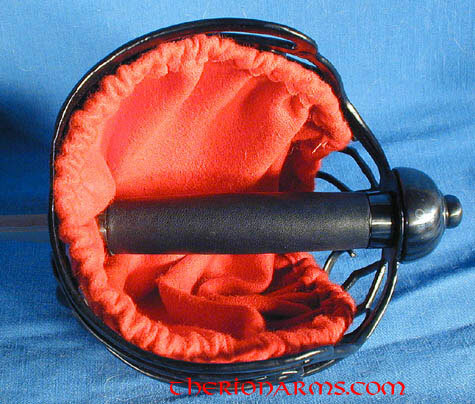 The basket hilt survived as a heavy cavalry weapon in England until about 1780. The Paul Chen/Hanwei 'practical' basket hilt backsword is tailored to the needs of the re-enactor. Featuring authentic hilt styling with fully tempered rebated and non-pointed blades, these swords are made to withstand rugged use while providing the level of safety required by many of today's re-enactment societies. The blade is fullered for balance and has a rebated 1/16" edge and a rounded tip. 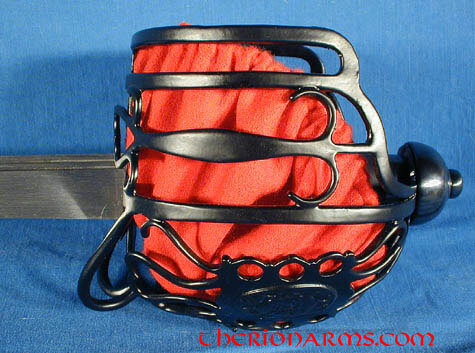 Includes a leather covered wooden scabbard with steel fittings.